That’s the rosy forecast by officials from the New Orleans Ernest N. Morial Convention Center, who are in the beginning stages of a $1.1 billion spending plan that they say will bring hordes of free-spending conventioneers to the Big Easy. Taxpayers would contribute $557 million over five years. This money would beautify and upgrade the exhibition hall with a new roof, nicer bathrooms and meeting rooms, digital signage and a so-called “linear park” along the front of the building on Convention Center Boulevard. About $87 million of the $557 million plan would help subsidize a 1,200-room hotel at the Convention Center’s upriver end while private investors would pour in another $550 million to build it. The Convention Center also would provide it with tax breaks worth tens of millions of dollars. The capital improvement plan and hotel are no sure bet, however. The convention business has been barely growing nationally, even while cities throughout the country have been spending more and more money on their exhibition halls to try to keep up with or ahead of the competition. What hasn’t been keeping up is attendance in New Orleans. The number of out-of-state attendees at conventions peaked almost 20 years ago, was further knocked down by Hurricane Katrina and has never come close to returning to its former heights. “The convention center market is characterized by too much supply and not enough demand,” said Robert Nelson, a professor at the University of Delaware’s Department of Hospitality Business Management. Nonetheless, tourism industry leaders, hotel general managers and Michael Sawaya, the Morial Convention Center’s president and general manager, insist that the planned investment in New Orleans will reverse the downward trend here. “The studies are clear that what we’re doing is creating new demand,” added Tim Hemphill, the center’s vice president of sales and marketing. A major reason is that attendance at convention centers nationally has grown by only 0.5 percent on average over the past 20 years, according to the Center for Exhibition Industry Research, a Dallas-based industry group. Construction of a $79 million “linear park” along the length of Convention Center Boulevard is the first visible sign of the $557 million capital spending program. The work is underway at a time when New Orleans Mayor LaToya Cantrell is demanding that hospitality industry officials and other political leaders agree to provide the Sewerage & Water Board $75 million in immediate one-time funding and $40 million in annual funding for upgrades to make the city less vulnerable to flooding and boil-water advisories. Cantrell has no direct say over how the Convention Center spends its money; it is a state entity, and the governor appoints most of its board. But she has been talking with Gov. John Bel Edwards and trying to rally public opinion behind her. She appears to have made some headway. Hospitality leaders have tentatively identified $50 million in one-time money and $20 million to $25 million in annual funding that could be available. The Convention Center opened in 1984 and was expanded once in the late 1980s and again in the 1990s. Center and tourism industry officials have sought to expand and enhance it again for 20 years. In 2004, they had a plan to make the building 50 percent bigger — known as the Phase IV expansion — to bring more visitors to New Orleans. An outside consultant, Minnesota-based Convention, Leisure and Sports International, said the expansion would be a winner. Stephen Perry, the CEO of the New Orleans Visitors and Convention Bureau, now known as New Orleans & Co., said it would be a “terrible mistake” to not build Phase IV, according to The Times-Picayune. 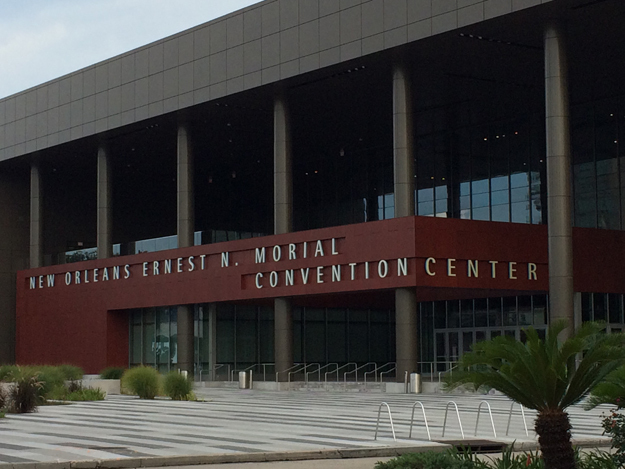 By 2004, out-of-state attendance at New Orleans conventions had dropped to 523,000 from the 1999 peak of 885,000, according to the Convention Center. In 2006, a year after Hurricane Katrina, center officials canceled Phase IV, saying there was no demand for it. They did spend $110 million to renovate the facility in the following years. Still, no one today is talking about reviving Phase IV. Instead, the goal is to boost the number of out-of-state visitors to the existing building, which is one of the biggest in the country. The Phase III expansion carried out in the 1990s created a building that is bigger now than is needed, according to Sanders, despite consultants’ promises back then that it would fill up with convention attendees. Only twice has the Morial Convention Center’s out-of-state yearly attendance since the 1999 peak topped 700,000. The figure was an estimated 668,000 in 2018, and 2019 “will be softer,” said Hemphill. Center officials prefer to cite bigger attendance numbers that include locals, while the out-of-state attendance numbers are buried inside a report deep within the Convention Center website. But the officials acknowledge that out-of-state attendance is what matters for lucrative hotel stays and higher visitor spending numbers. Convention centers nationally shoot for a 70 percent occupancy rate, Sawaya said. In New Orleans, it was only 56 percent in 2017. And it was only 33 percent at the halls near the eight-block-long building’s upriver end for events aimed at convention-goers from out of state. Convention Center officials and their outside consulting firm, HVS, say the proposed hotel is needed to fill those upriver halls, in particular. But the hotel would be so far away from the French Quarter and many of New Orleans’ famous restaurants that officials feel compelled to offer a massive taxpayer-funded subsidy. Under a proposal released last year, the Convention Center would spend $26 million preparing the land for the hotel and then provide it to the developers for free. In addition, it would contribute $41 million in cash to the project and spend another $20 million to connect the hotel to the Convention Center across Henderson Street. The hotel would also receive tens of millions of dollars in other public subsidies in the form of tax rebates and abatements. The independent Bureau of Governmental Research put the overall subsidy at $330 million over 40 years. HVS said it would be $173 million. Thomas Hazinski, with HVS, estimated in August that the hotel would generate 172,000 net new hotel room nights per year and $24 million in new tax revenue and would create 1,900 new permanent jobs by 2026, three years after opening. A month later, in its own report, BGR challenged the accuracy of the room night and tax revenue projections. BGR said the figures didn’t seem to take into account another finding in the consultants’ report, that the new hotel would take business from existing hotels, at least during the early years. HVS, though, sees a dim future for the Morial Convention Center if the hotel is not built, even if $557 million in taxpayer dollars are spent on other projects. The Convention Center can carry out the ambitious spending plan because it holds $235 million in reserves built up over the last 15 years. The funding comes from dedicated taxes on hotel guests in New Orleans, and from a 0.75 percent sales tax on all food and beverages consumed at restaurants and bars. One cent of the tax on hotel guests was instituted in 2002 and was supposed to fund the center’s Phase IV expansion. Even though that project was canceled after Katrina, the tax remained in effect and is boosting the facility’s reserves by $10 million to $15 million per year. The Convention Center would pay for the $557 million spending program by dipping into its reserves and issuing bonds. Besides building the linear park and subsidizing the hotel, the spending plan contemplates renovating 143 meeting rooms in the Convention Center itself at a cost of $174 million. Another $41 million would replace the leaky roof, whose size is equivalent to 35 football fields. Digitizing signs throughout the building would cost $11 million. Renovating 72 bathrooms would cost $15 million, or $208,000 per bathroom. Customer surveys show more complaints about the bathrooms — which have up to 20 stalls each — than anything else, Sawaya said. But Nelson, of the University of Delaware, said convention center upgrades throughout the country don’t seem to recognize how the business has changed. In the 1990s, Nelson said, conventioneers wanted to see the latest wares and exhibits in their industry and buy them on the spot. Now, he said, even if their trade group still holds a big convention, they go to network and later will buy what they’ve seen on the Internet at the lowest price available. Twenty years ago, Nelson wrote an academic paper describing what drove the spending by convention centers. “The architects who design the facilities are not likely to suggest that construction of convention centers be slowed,” he wrote. “Brokers who get handsome commissions for arranging the financing of these projects are not going to knock the system. Tourism officials, hoteliers, construction companies and labor unions also have a lot to gain by encouraging convention center construction. In a recent interview, Nelson said what he wrote then remains true today. Tourism industry officials dominate the Morial Convention Center’s board. At its two most recent monthly meetings, questions challenging the status quo came only from Ryan Berni, a political consultant; Tiger Hammond, a union leader; and Ronald Guidry, an insurance company owner. Questioned during an interview about the need for all the proposed spending, Sawaya said his responsibility is to use the Convention Center’s funds to upgrade the building and create a better experience for convention-goers. Sanders, the professor in Texas, said officials ought to think more broadly.